“I don’t have the same day twice to be honest. Staff and students seem to have 1,000 different needs and I try to meet them all the best I can,” said Deana Beecher, Media Specialist at MSD of Decatur Township Schools and the interviewee of this article. With so many demands from teachers and administrators, she uses the tools she has to be highly effective and efficient. The MSD of Decatur Township is a school district in Indianapolis, Indiana that strives to provide their more than 6,500 students and 800 staff with robust opportunities and innovative experiences and education. With the Township’s goals of quality and innovative opportunities and experiences, they have been aggressive to explore digital education technology solutions. 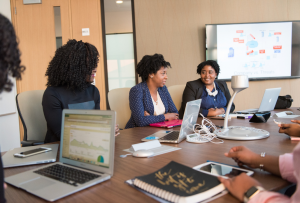 School buildings have an increasing number of TV screens in hallways, common areas, and other places in the building that often are not being used during most school hours. Now, with MyVRSpot’s SmartSigns solution, administrators, technology coordinators, and media specialists can efficiently publish and update media on these monitors. Additionally, school districts can pair their MyVRSpot live streaming service with their Digital Signs. Can you imagine the frustration? When someone made a small tweak to a file that Deana had previously uploaded, she would have to go through the entire logging-in and uploading process for each IP address again. That’s rough. “When the computers behind the monitors ended up dying, we had no way to talk to them. And that’s when MyVRSpot suggested using their SmartSigns solution partnered with a Raspberry Pi device”, explained Deana. 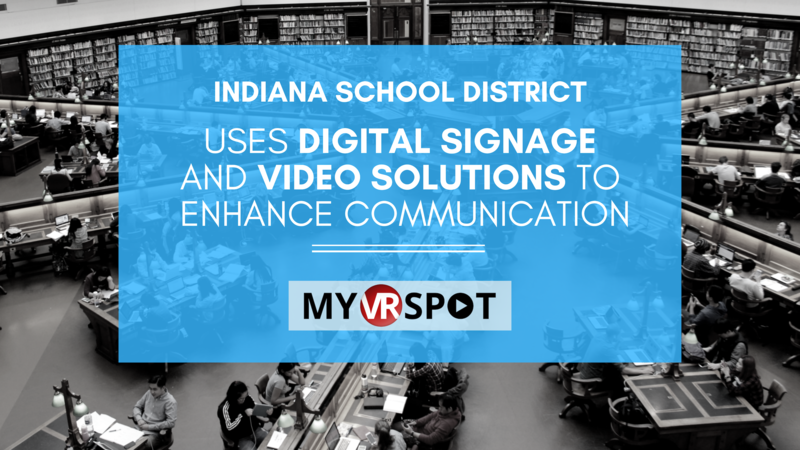 The Decatur Township was one of MyVRSpot’s first clients to test their Digital Signage solution. “We mounted Raspberry Pis behind each monitor and the MyVRSpot team did a lot of behind the scenes work and provided us with training,” Deana reflected. Administrators can schedule media items to appear or be removed from a Digital Sign on a specific date and at a specific time. Otherwise, you also have the option to “Add Immediately” and the media will instantly be added to the Sign until it’s removed. Deana and MSD of Decatur Township also use MyVRSpot for multimedia and video solutions including hosting, sharing, creating HTML projects, and screen capturing. Not only is it for hosting, but also to share, archive, and collaborate on their various digital files including videos, images, audio files, documents, and more. Videos can be added to an ever-expanding digital repository, available to all administrators, teachers, and student within the district. It also ensures that the district controls how content is shared. To share media, users can share via a URL link, embed videos into a website, or share with a QR code. “You can make whatever you like in MediaSpot, as in simplest terms, it’s a drag-and-drop HTML editor. It’s easy to create an “interactive” project or newsletter, where you can add your text fields, videos, images, downloadable documents, and much more. Now you can create your own video tutorials that save directly into your account. So whether you want to capture your entire screen, an open application, or just one of your browser tabs, it doesn’t get much easier than this. Access the Recorder tool from the main menu and get started today. If you currently have a MyVRSpot account and want to learn more about creating your own Digital Sign, building station work with MediaSpot, or how to screen capture your own tutorial videos, check out our Online Resource Guide by clicking the question icon [above image] after logging into your account. If you’re not a MyVRSpot client and considering one of, or multiple, MyVRSpot’s solutions, let us know. We believe the best way to evaluate if a solution is right for your district, is to pick it up and use it, within your own environment. Start you limited trial account for yourself, your school, or district today.